Group of three to Lieutenant-General Sir John William Cox, K.C.B., 13th Regiment.Cabul 1842 (Lieut. J. W. Cox, H.Ms. 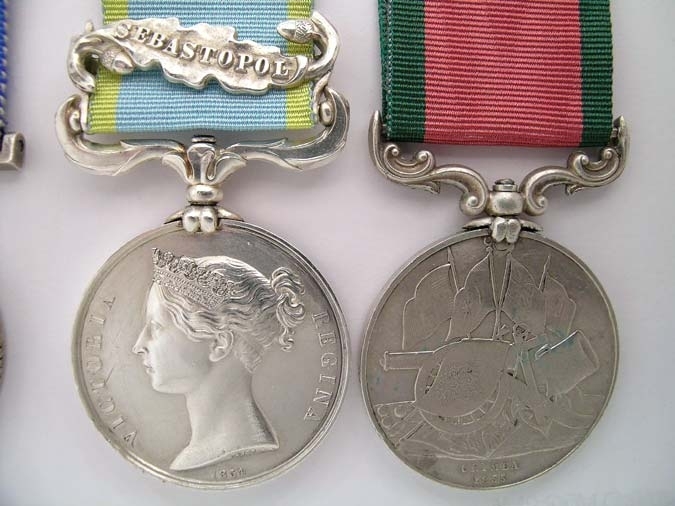 13tf Regt), engraved naming, original steel claw and replacement straight bar suspension; Crimea 1854-56, 1 clasp, Sebastopol (Major J. W. Cox, C.B., 13th Regt. ), engraved naming; Turkish Crimea 1855, British issue (Major J. W. Cox, C.B., 13th Regt. ), engraved naming, fitted with scroll suspension, very fine and better. John William Cox was commissioned an Ensign in the 13th Regiment on 26 June 1838 and received promotion to Lieutenant on 22 April 1840. 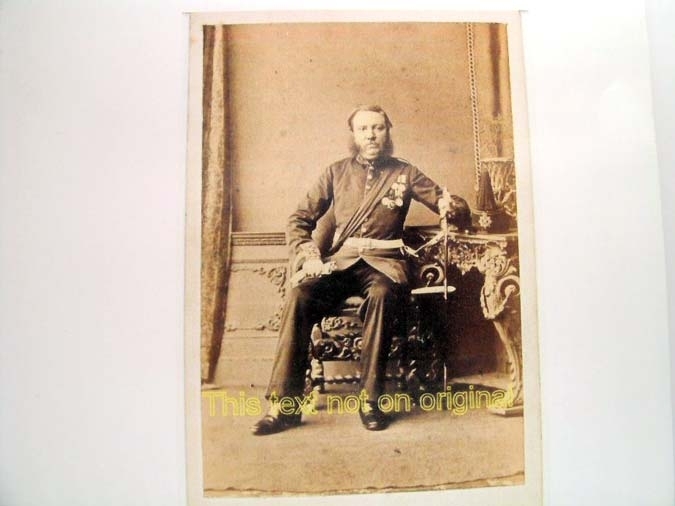 He served in Afghanistan during 1840-42. Was present at the assault and capture of Tootumdurrah, storming of Jhoolghur, the night attack on Baboo Koosh Ghur, attack on Khardurrah, storming of Khood Cabool Pass, affair at Tezeen, forcing the Jugdulluck Pass, reduction of Fort of Mamoo Khail, defence of Jellalabad and sorties on 14 November (Mentioned in despatches), 1 December 1841 and 11 March, 14 March and 1 April 1842, general action at Jellalabad (Mentioned in despatches for ?gallant conduct throughout the day? and for being ?the first of the party ..... to seize two of the enemey?s cannon? ), the storming of the Jugdullock Heights, the general action at Tezeen and the recapture of Cabul. The 13th Regiment left India in December 1844. 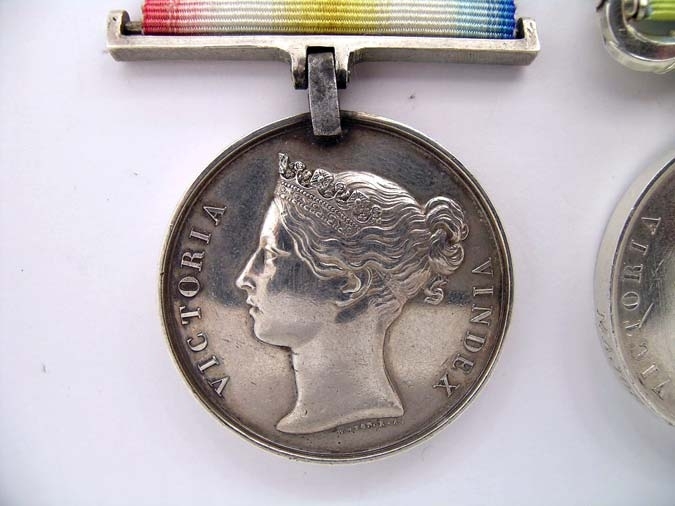 Despite his numerous and gallant services during the Afghan War promotion was slow and he was advanced by purchase to Captain on 9 April 1847. In the Crimea War he served from 30 June 1855, taking part in the battle of Tchemaya and the siege of Sebastopol. For his services he was awarded the Order of Medjidie 5th Class. He was awarded the Brevet of Major on 15 December 1854 and was advanced to that rank on 25 January 1856. In the Indian Mutiny he was employed in the Azimghur and Gorruckpore districts, and was actively employed in eight engagements. 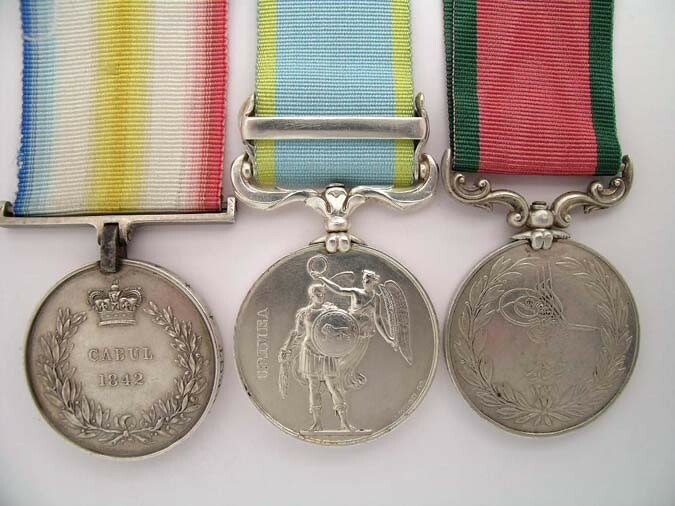 For his services he was mentioned in despatches, received the brevet of Lieutenant-Colonel and awarded the C.B. Promoted to Colonel on 4 September 1863 and Major-General on 23 March 1869, he commanded troops in Jamaica, 1872-77. He retired with the rank of Lieutenant-General on 21 September 1882. He was knighted, receiving the K.C.B. in 1896 and was Colonel of the Bedford Regiment, 1893-1900. Lieutenant-General Sir John William Cox died on 2 October 1901. Sold with copied research and photograph.